"[Jan Karon's] wonderful cookbook is like a souvenir scrapbook to be dipped into time and again. The read world should be as good as Mitford." Millions of readers have discovered the delights of a trip to Mitford, and they've all found themselves hankering for mouthwatering dishes like Father Tim's Rector's Meatloaf and Esther Bolick's outrageously delicious Orange Marmalade Cake. Now, Jan Karon makes it easy to satisfy all these cravings and many more. Along with 150 fabulous recipes are Jan's personal reminiscences, dozens fo beloved scenes from each of the Mitford books, jokes, cooking tips, blessings, and a wonderful story never before published in the novels. 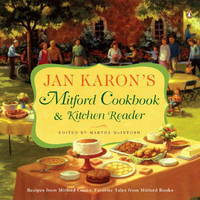 For readers and cooks alike, Jan Karon's Mitford Cookbook & Kitchen Reader is a veritable feast. 2004-02-09. New. Ships with Tracking Number! INTERNATIONAL WORLDWIDE Shipping available. Buy with confidence, excellent customer service! 2010-09-06. New. Ships with Tracking Number! INTERNATIONAL WORLDWIDE Shipping available. Buy with confidence, excellent customer service! G.P. Putnam's Sons, 2010. Paperback. New. 8.96 x 8.99 cm. Viking. Hardcover. 0670032395 New Condition. . New. Viking. Hardcover. 0670032395 New Condition *** Right Off the Shelf | Ships within 2 Business Days ~~~ Customer Service Is Our Top Priority! - Thank you for LOOKING :-) . New. 2010-09-06. Good. Ships with Tracking Number! INTERNATIONAL WORLDWIDE Shipping available. May not contain Access Codes or Supplements. May be ex-library. Shipping & Handling by region. Buy with confidence, excellent customer service! 2004-02-09. Good. Ships with Tracking Number! INTERNATIONAL WORLDWIDE Shipping available. May not contain Access Codes or Supplements. May be ex-library. Shipping & Handling by region. Buy with confidence, excellent customer service! Viking. Hardcover. 0670032395 Like New Condition. . Fine. Penguin Books, 2010-09-28. Reprint. Paperback. Used:Good. Penguin Books. PAPERBACK. 014311817X *LIKE NEW* Ships Same Day or Next! . Fine. Penguin Books. PAPERBACK. 014311817X *BRAND NEW* Ships Same Day or Next! . New. NEW YORK: VIKING PENGUIN. VG/VG PAGES CLEAN, BINDING TIGHT. Pages: 364. . 2004. 1ST PRINTING. HARDCOVER.. Condition: VG/VG PAGES CLEAN, BINDING TIGHT. Pages: 364. Penguin Books. PAPERBACK. 014311817X Brand New! Not Overstocks or Low Quality Book Club Editions! Direct From the Publisher! We're not a giant, faceless warehouse organization! We're a small town bookstore that loves books and loves it's customers! Buy from us and you get great service as well as a great price! Your business is valued and your satisfaction is guaranteed! . New. New York: Viking. Hardcover. 2004. 1st Printing. Large sq. 8vo 363pp . Fine in Fine DJ. Color Illustrations . Viking. Hardcover. 0670032395 Fast Handling - Ships next Business Day!!!! . New. Viking. Hardcover. 0670032395 Ships from Tennessee, usually the same or next day. . New. 2004. Viking. Hardcover. 0670032395 . . New. 2004. Viking. Hardcover. 0670032395 Card in envelope on inside cover page . Fine. Penguin Books, 2010-01-01. Softcover. New. GREAT Bargain Book Deal - some may have small remainder mark - Ships out by NEXT Business Day - 100% Satisfaction Guarantee! New York, New York, U.S.A.: Viking Pr, 2004. 1st Edition 1st Printing. Hardcover. Near Fine/Fine. 8vo - over 7¾" - 9¾" tall. First Edition (Number Line With The One Present). Includes Index And Recipe Credits. The Book Is Bound In Yellow With Green And Red Lettering On The Spine. Green Bordered Image Of Whitelily Flour With Sifter On The Front. A Small Faint Stain On The Lower Page Edges, Else Fine. Viking. Hardcover. 0670032395 New Inside and Outside. Clean and crisp pages w/no markings! You will be pleased. Excellent book! ( z1s200A ) Some very minor shelf wear on dust cover. ** Fast Shipping** . New. Penguin Books, 2010-01-01. Softcover. Like New. BookCloseouts scratch & dent version. New book that may have some cosmetic damage (i.e. shelf-wear, torn or missing dust jacket, dented corner...). Otherwise excellent specimen - guaranteed! Viking. Hardcover. 0670032395 Crisp pages and tight binding. Slight shelf wear on dust jacket. Previous owners mark in front of book. Personal dedication written on the inside. . Fine. Viking. Hardcover. 0670032395 Crisp pages and tight binding. Appears unread. Slight shelf wear on cover. . Fine. Viking. Hardcover. 0670032395 Crisp pages and tight binding. Slight shelf wear on cover. Light sun fading. . Fine. Viking. Hardcover. 0670032395 Crisp pages and tight binding. Appears unread. Light shelf wear on cover. . Fine. Viking. Hardcover. 0670032395 Crisp pages. Tight binding. Light shelf wear on dust jacket. Dirty edges. Light tanning. . Very Good. Viking. Used - Acceptable. Acceptable condition. No Dust Jacket Dampstained. Reading copy only. Viking. Used - Very Good. Very Good condition. Very Good dust jacket. Viking. Hardcover. POOR. Noticeably used book. Heavy wear to cover. Pages contain marginal notes, underlining, and or highlighting. Possible ex library copy, with all the markings/stickers of that library. Accessories such as CD, codes, toys, and dust jackets may not be included. Penguin Books. Paperback. POOR. Noticeably used book. Heavy wear to cover. Pages contain marginal notes, underlining, and or highlighting. Possible ex library copy, with all the markings/stickers of that library. Accessories such as CD, codes, toys, and dust jackets may not be included.